The solar array installed atop the Gordon Indoor Track offers 591.5 kilowatts of clean-energy capacity. Have 1.5 acres of flat roof space, will go solar. 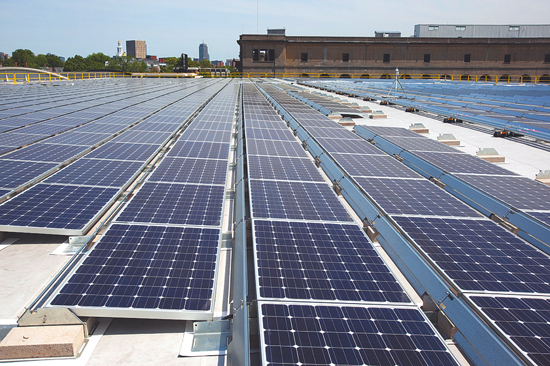 Borrego Solar Systems installed 2,275 solar photovoltaic panels (Harvard’s largest campus solar array) atop the Gordon Indoor Track and tennis complex, creating 591.5 kilowatts of clean- energy capacity. According to the University news release, the investment is expected to have a six- to 10-year payback. edX, the Harvard-MIT online education joint venture announced in May (see “Harvard, Extended,” July-August), welcomed the University of California, Berkeley, as a third teaching partner; it also brings online technology to the edX platform. The consortium (www.edx.org) plans to offer seven courses this fall: three from MIT (circuits and electronics; introductory computer science; solid-state chemistry), two from Berkeley (artificial intelligence; software), and two from Harvard (a version of the popular Computer Science 50 programming course; a public-health course on biostatistics). Humanities and social-sciences offerings, hinted at during the May announcement, are deferred until next year. The for-profit Coursera (www.coursera.org) enterprise, launched by Stanford, Princeton, Penn, and the University of Michigan, announced a dozen new partners (among them Duke, Caltech, Johns Hopkins, the University of Virginia, and the University of California, San Francisco) and 116 online courses in 16 fields, from life sciences and computing to the humanities. President Drew Faust’s most recent book, This Republic of Suffering: Death and the American Civil War (excerpted in this magazine’s January-February 2008 issue), has now been translated into a Ric Burns television special for the American Experience series. The two-hour documentary, Death and the Civil War, airs on September 18 at 8 p.m. Faust, who figures prominently in the film, plans to attend events for the program in Boston, New York, and possibly other cities. The Simons Foundation—founded by mathematician and hedge-fund manager James Simons and his wife, economist and philanthropist Marilyn (Hawrys) Simons—has conferred Simons Investigator grants on 21 academic mathematicians, theoretical physicists, and computer scientists, an initial round of five-year, $120,000 annual unrestricted grants much like MacArthur Foundation fellowships. Among those funded are professor of mathematics Horng-Tzer Yau, a probabilist and mathematical physicist, and Michael P. Brenner, Glover professor of applied mathematics and applied physics and area dean for applied mathematics in the School of Engineering and Applied Sciences. Brenner’s work has engaged problems from fluid mechanics to the evolution of protein functions. The awards are renewable once. The foundation recently gave $60 million to Berkeley (James’s doctoral alma mater) to create the Simons Institute for the Theory of Computing; $150 million to Stony Brook University (Marilyn’s undergraduate and doctoral alma mater) for medical research, 35 faculty chairs, and student support; and $26.5 million to MIT (James’s undergraduate alma mater; he is a member of the corporation) for autism research. As Harvard begins to bring art-making and performance into the curriculum (see http://harvardmag.com/art-12), other institutions continue to invest in these fields. Dartmouth alumnus Leon Black and his wife, Debra, have given $48 million for a new visual-arts center, opening in September; it will house the departments of studio art and of film and media studies, and a digital-humanities program, alongside the expanding Hopkins Center for the Arts and Hood Museum of Art. The new center includes classrooms, faculty offices, a gallery, a screening room, and an auditorium, plus studios and filmmaking spaces.…The foundation of Yale alumnus James H. Binger recently gave the Yale School of Drama $18 million in operating support and an endowment for a center for new theater that will fund and stage new works. MIT’s Computer Science and Artificial Intelligence Laboratory has announced a “[email protected]” initiative to focus research on enormous data sets requiring new processing technologies. Intel Corporation funded a five-year program, with an investment of up to $12.5 million, to investigate problems in medical, financial, social-media, security, and data-intensive fields.…New York University has won city approval for its multidecade, multimillion-square-foot campus expansion plan in Greenwich Village.…Continuing a series of Ivy League changes in financial aid, Cornell has tightened its “no-loan” package; it now applies to entering undergraduates from families with incomes of $60,000 or less, compared to the previous $75,000 threshold.…Following New York’s ventures with Cornell and NYU to enhance applied science and engineering in the city, it has pledged $15 million of support for Columbia’s new Institute for Data Sciences and Engineering, which aims to hire at least 75 new faculty members during the next 15 years. The department of history of art and architecture and the Graduate School of Design will offer a new undergraduate track in architectural studies, beginning this fall. Students will be able to enroll in graduate-level courses in architecture history and theory, studio and design, and basic architectural techniques; if so inclined, they may pursue an architecture concentration, melding senior-year work with first-year GSD class requirements. Separately, the School of Engineering and Applied Sciences and the Graduate School of Arts and Sciences are offering a master of science in computational science and engineering, focusing on large-scale computation and mathematical modeling. For further information, see http://harvardmag.com/art-architecture and http://harvardmag.com/applied-science, respectively. Sculptor Dimitri Hadzi, who was professor of visual and environmental studies, is best known locally for Omphalos, the vertical granite work at the Harvard Square T station. Now his widow, Cynthia Hadzi, has donated Gilgamesh to the Harvard Mineralogical Museum, which has installed the work in a nearby courtyard—a welcome addition to a campus with relatively few works of outdoor public art. Director doctor. Psychiatrist Paul J. Barreira has been appointed director of Harvard University Health Services and Oliver professor of hygiene. He succeeds David S. Rosenthal ’59, who is retiring, in both posts. As director of behavioral health and academic counseling at HUHS, Barreira has overseen student mental-health and alcohol and other drug services, sexual-assault prevention and response operations, and the Bureau of Study Counsel. Organs on chips. The Wyss Institute for Biologically Inspired Engineering has entered into an agreement with the Defense Advanced Research Projects Agency, worth up to $37 million, to develop 10 human “organs on chips,” linked together to mimic whole-body physiology, to accelerate testing of potential drugs without animal or other living-organism tests. The project leaders are Wyss director Donald E. Ingber, Folkman professor of vascular biology and professor of bioengineering, and Kevin Kit Parker, Tarr Family professor of bioengineering and applied physics. BGLTQ director. Harvard College dean Evelynn M. Hammonds has appointed Vanidy M. Bailey as director of Bisexual, Gay, Lesbian, Transgender, and Queer student life. Bailey, who oversaw programs at the LGBT Resource Center at the University of California, San Diego, will be responsible for BGLTQ student and organization advising, programming, staff training, alumni relations, and policy, and will supervise the student-run Queer Resources Center. World lit. Martin Puchner, Wien professor of drama and of English and comparative literature, is general editor of the multivolume, third edition of The Norton Anthology of World Literature. The recently published reference includes works ranging from European classics to Mayan and ancient Egyptian texts. Miscellany. Natasha Trethewey, RI ’01, a Radcliffe Institute Fellow six years before her collection, Native Guard, won the Pulitzer Prize in poetry, has been named poet laureate of the United States.…Robert B. Zoellick, M.P.P.-J.D. ’81, who concluded his term as president of the World Bank on June 30, has become a senior fellow of the Harvard Kennedy School’s Belfer Center for Science and International Affairs, and a visiting fellow at the Peterson Institute for International Economics, in Washington, D.C. …The list of new fellows of the American Academy of Arts and Sciences published in the July-August issue (see "University People") inadvertently omitted Robert H. Giles, curator emeritus of the Nieman Foundation for Journalism and a director of Harvard Magazine Inc.